There were lots of people and organizations that Norwegian chess superstar Magnus Carlsen needed and wanted to thank after becoming World Chess Champion for the third time in a row on Wednesday night. His most touching tribute, though, went to his father Henrik, a mild-mannered engineer who recognized his son’s talent at an early age and has stayed by his side ever since. After running through the obligatory lists of championship organizers, sponsors and other key members of the apparatus around him, Carlsen settled on the most important person of all. “Last, but not least, I want to thank my father,” Carlsen said. “He is really the best support I have. He is the best person I know. He always sacrifices his time for me, he’s done that since I began to play. 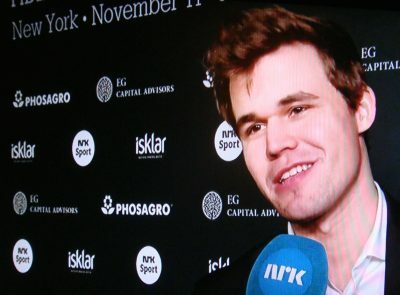 Norwegian Broadcasting (NRK), which has closely followed the World Chess Championships from New York for the past three weeks, reported that Carlsen’s father seemed surprised by his son’s tribute. When the applause and jubilation from assembled fans and the press died down, the elder Carlsen was both pleased and relieved. Carlsen beat Russia’s Sergey Karjakin in what amounted to the 16th game in overtime, by what some chess commetators called both a genialt move and a “stylish queen sacrifice” (external link) that will always be remembered. 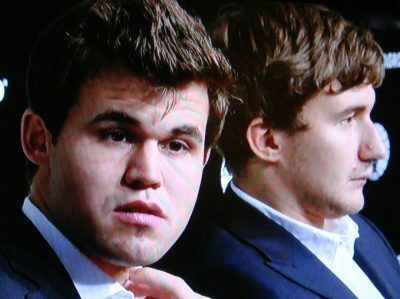 “I was very satisfied with that move,” Carlsen said later. “I was a fun way to end the match.” Others launched into superlatives: “It was the kind of move every chess player dreams about getting a chance to make,” commentator Maurice Ashley told NRK, after Carlsen sacrificed one of his strongest pieces to win. Such chances rarely arise, and it’s even more seldom that players find themselves able to make it. “That move will be remembered forever,” Ashley said. Carlsen and Karjakin had played to two draws in the tie-breaker round of four rapid chess games on Wednesday, but Carlsen dominated the last two. He said he was especially satisfied with his final move that led to checkmate against Karjakin. Carlsen’s Russian challenger, who also is 26 years old, won great respect during the marathon championships, and also “won many friends and fans in Norway,” according to NRK commentators, because of his skills, strong defense and “sympathetic” demeanor. Even after Carlsen had a temper tantrum of sorts and stormed out of an obligatory press conference after losing a game to Karjakin, the young Russian was gracious and complimented Carlsen’s play. He was equally so after losing the championship to Carlsen with millions of Russians watching back home on TV and video links in the middle of the night local time. A lucrative consolation prize was waiting, though. The match, with sponsors including EG Capital Investors and Russian fertilizer company PhosAgro that competes against Norway’s own Yara, had a prize fund of EUR 1 million (around USD 1.1 million) with the winner getting 55 percent and the loser 45 percent.